How do doctors decide when to give babies hypothermia therapy? How do doctors decide when to give babies hypothermia therapy? What criteria do doctors use to decide whether a baby should get hypothermia therapy? In order to determine whether a baby should get therapeutic hypothermia (brain or body cooling), medical professionals first must determine if the infant is showing signs of hypoxic-ischemic encephalopathy (HIE). Doctors will only provide hypothermia treatment if certain criteria are met. If medical professionals fail to quickly recognize the signs of HIE, the baby may not receive treatment within the crucial six hours after the injury. This means that time is of the essence when HIE is suspected. When should doctors administer therapeutic hypothermia? The baby is less than six hours of age, and was born after at least 36 weeks of pregnancy. The baby is no more than 12 hours of age, and was born after at least 34 weeks of pregnancy. A collapse after birth that results in hypoxic-ischemic injury. When should a baby not receive therapeutic hypothermia? The AMC PSO guidelines state that babies should not receive hypothermia therapy if they were born very preterm (under 34 weeks into pregnancy), and that physicians should exercise extreme caution if they weigh less than 1,750 grams, have severe congenital abnormalities, suffered major intracranial hemorrhage, have overwhelming septicemia, or show evidence for a blood clotting disorder that could make the treatment dangerous. Therapeutic hypothermia is now considered to be standard of care for infants with hypoxic-ischemic encephalopathy, but only if they meet all eligibility criteria. This treatment has been shown to increase survival rates, minimize permanent brain damage from HIE, and reduce the likelihood of a child developing associated disabilities such as cerebral palsy. Hospitals and medical organizations should prioritize improving access to therapeutic hypothermia. In addition to providing the technology, this includes better training for medical professionals, so that they can promptly and accurately assess whether a baby should be given this treatment. 1. Is therapeutic hypothermia still effective if commenced more than six hours after birth? A recently-published study (2) in the Journal of the American Medical Association (JAMA) suggests that hypothermia therapy may be effective 6-24 hours after birth. Laptook et al. (2017) conducted a randomized clinical trial of infants with moderate or severe HIE. 83 infants were given hypothermia therapy, while 85 were maintained at a normal body temperature (control group). The authors then followed up with these cohorts between 18 and 22 months of age. Their results were non-significant under traditional frequentist analysis, but they suggested that hypothermia therapy may still be helpful more than six hours after birth. Laptook et al. stress that further research is warranted, because an improved prognosis in even a small percentage of patients could be of clinical importance due to the severity of HIE-related brain damage. Moreover, they found “no evidence of commensurate harm” – in other words, the potential benefits of administering hypothermia therapy between 6-24 hours may outweigh the costs. 2. Should babies with mild HIE receive therapeutic hypothermia? However, they note that experimental trials in animals do support the use of therapeutic hypothermia in treating mild HIE, which warrants a randomized control trial on human infants with mild HIE. How accurately can the severity of brain damage be assessed in the first six hours of life? Can physicians distinguish between those who are actually “mildly” affected and those who are at high risk for developing disabilities? What other tests could be incorporated to improve assessments of neonatal encephalopathy/determination of eligibility for therapeutic hypothermia? Will therapeutic hypothermia improve or worsen neurological outcomes for babies with mild HIE? 3. Should premature babies receive therapeutic hypothermia? Whether or not premature infants should receive therapeutic hypothermia is a complicated question. The current AMC PSO guidelines state that babies born after 36 weeks should be given this treatment, and that it can be considered in those born between 34-36 weeks. Clinicians have been reluctant to provide this treatment to premature infants because they may be more susceptible to complications such as intracranial hemorrhage (brain bleeds), arterial hypotension, and respiratory distress syndrome (RDS). However, further research is needed in order to compare the potential risks and benefits of therapeutic hypothermia in preterm babies (4). 4. What else can be done to help newborns with HIE? 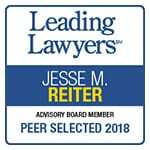 In order to further knowledge on treatments for HIE, Jesse Reiter (ABC Law Centers owner and founder) recently established the Reiter HIE Research Fund. This fund supports the work of Dr. John Barks, who is a Professor in the Department of Pediatrics and the Director of the Division of Neonatal-Perinatal Medicine at the University of Michigan. Dr. Barks’ clinical and laboratory work is critical to the development of new treatments for newborns with hypoxic-ischemic encephalopathy (HIE). Learn more about the fund, and how you can help, here. Unfortunately, hypoxic-ischemic encephalopathy is often caused by medical negligence during or around the time a baby is born. If physicians fail to order therapeutic hypothermia for a baby that needs it, this is also negligence. The birth injury attorneys at ABC Law Centers have a particular focus on hypoxic-ischemic encephalopathy and therapeutic hypothermia. This narrow focus has allowed us to develop an extensive knowledge of both the medical and legal aspects of HIE cases, amassing a long track record of successes in representing our clients. If you believe your baby needed therapeutic hypothermia and did not receive it, or needed brain cooling due to a medical staffer’s mistake, please contact us today. Clients pay nothing throughout the entire legal process unless we win. The Academica Medical Center Patient Safety Organization (AMC PSO) Neonatal Encephalopathy Task Force. (2016). Therapeutic Hypothermia in Neonates: Recommendations of the Neonatal Encephalopathy Task Force[Pamphlet]. Laptook, A. R., Shankaran, S., Tyson, J. E., Munoz, B., Bell, E. F., Goldberg, R. N., … & Das, A. (2017). Effect of therapeutic hypothermia initiated after 6 hours of age on death or disability among newborns with hypoxic-ischemic encephalopathy: a randomized clinical trial. Jama, 318(16), 1550-1560. El-Dib, M., Inder, T. E., Chalak, L. F., Massaro, A. N., Thoresen, M., & Gunn, A. J. (2019). Should therapeutic hypothermia be offered to babies with mild neonatal encephalopathy in the first 6 h after birth?. Pediatric research, 1. Herrera, T. I., Edwards, L., Malcolm, W. F., Smith, P. B., Fisher, K. A., Pizoli, C., … & Bidegain, M. (2018). Outcomes of preterm infants treated with hypothermia for hypoxic-ischemic encephalopathy. Early human development, 125, 1-7.